Kim graduated from Centerville High School in 2005. She received her Bachelor of Arts in Journalism from Indiana University in 2009. Kim earned her law degree in 2012, graduating from the University of Dayton School of Law. Kim joined the firm as an Associate Attorney in 2017, after working elsewhere as an estate planning attorney for five years. Her practice now focuses on estate planning and administration, guardianships, Medicaid and nursing home planning, asset protection, special needs planning and elder law. 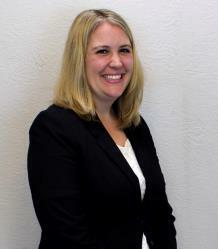 Kim joined the Ohio Bar in November 2012. Kim is a member of ElderCounsel, a national network of elder law attorneys, and WealthCounsel, a national organization for estate planning attorneys. She is a member of the Ohio State Bar Association (Estate Planning, Trust and Probate Law Section; Elder Law Committee), the Dayton Bar Association (Estate Planning, Trust and Probate Committee), and the Greene County Bar Association. Kim serves as a Board Member for the Partnership for Philanthropic Planning of Greater Dayton. She is also involved with the Greater Dayton Volunteer Lawyer Project, and she serves as volunteer legal counsel for the Greene County Community Foundation. Kim regularly volunteers her time to speak at public and service organization presentations to educate other professionals and the community on estate, special needs and elder planning topics. Kim also enjoys serving as a contributor to the Dayton Moms’ Blog. Kim was born and raised in Centerville, where she now lives with her husband, Adam, and their two beautiful daughters, Cecilia and Abby.